Thermal stabilization of soil is a ground improvement technique. The concept, method and applications of thermal stabilization of soil is discussed. It has been observed that heating or cooling shows certain marked changes in the soil properties. Many types of research were conducted on the same and many impressive results were observed that is found relevant for soil stabilization. 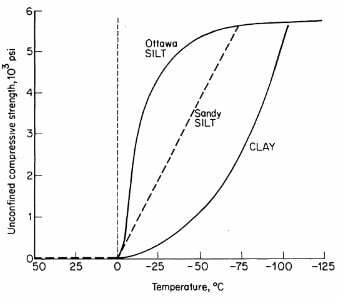 The below figure represents the ultimate strength of three soils with temperature as a function. Like seepage or consolidation analysis of soil, a heat flow analysis can also be carried out. The transfer of heat in soil occurs by conduction, convection (free, forced, by thawing) and radiation. The most predominant mechanism of transfer is through conduction, which takes place in three constituents of soil which are soil solids, water (which may be in the form of a liquid, ice or vapor) and pore air. The phenomenon of heat conduction is influenced by soil thermal properties which are its thermal conductivity, latent heat of fusion, the heat of vaporization of soil water and the heat capacity of the soil. The behavior of heat flow in soil is mainly governed by the latent heat of fusion of water on freezing and heat of vaporization of water on heating above 1000C. The latent heat of fusion can be defined as the heat amount that must be added to the unit mass of a substance to change it from liquid to solid or solid to liquid without any change in the temperature. Now, the heat of vaporization is defined as the heat required to change the substance from liquid to vapor. The thermal conductivity of soils can be determined by several methods, some of which are Kernsten’s empirical equations, Johansen’s method etc. It is noted that higher the heat input per mass of the soil (which should be treated), the greater would be the effect. A small increase in temperature will cause a strength increase in fine-grained soils due to the reduction of electric repulsion between the particles, pore water flow due to variation in thermal gradient and due to the reduction in moisture content because of increasing evaporation rate. 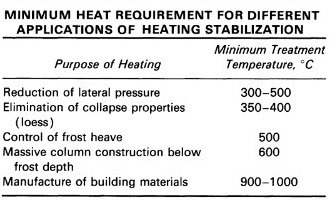 Therefore, it is found that it is technically feasible to stabilize fine-grained soils by heating. The following mentioned statement gives the temperature and the corresponding possible change in soil properties. 1000C Cause drying and a significant increase in the strength of clays. This results in decrease in the compressibility of the soil. 5000C Cause permanent changes in the structure of clays results in a decrease of plasticity as well as moisture adsorption capacity. 10000C Cause fusion of the clay particles into a solid substance like brick. It has been experimented and found that heat was able to change an expansive clay into an essentially none- expansive material. When liquids or gas fuels are burned in boreholes or an injection of hot air into 0.15m to 0.20m diameter holes, resulted in the formation of 1.3 to 2.5m diameter stabilized zones after continuous treatment for 10 days. These effects take place at a temperature range from 300OC to over 10000C. Soil melts at a temperature of 1250 to 17500C. The melting point of the soil can be reduced by addition of fluxing agents such as Na2CO3. Where w= moisture content in percentage, T = burning temperature, Cf = unit heat capacity of the fuel, where 35% is for open burning and 70% for closed burning and F= fuel used per unit volume of the soil.